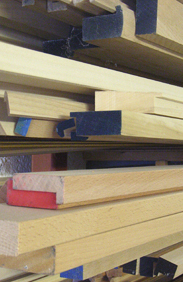 Bare wood mouldings (left) are our best sellers. Available in a range of sizes and types of wood. Ash, beech, lime, tulipwood (poplar), and oak being the most common, maple and black walnut are also available. 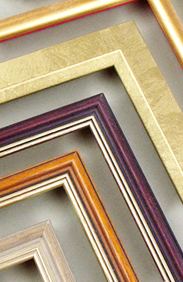 A frame is made with bare (untreated) wood, to which a finish is applied before the mounts, glass, protective layers, and artwork are assembled within. We also stock a small selection of traditional mouldings (right), with hundreds more available from our regular wholesalers. We mill many of our own mouldings in-house, working to slender dimensions that exceed the boundaries imposed by standard ranges. In this way we can create truly bespoke picture frames. 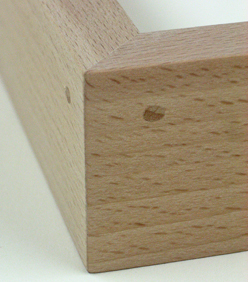 The beech moulding pictured (right) is elegantly proportioned at 43mm deep on the outer edge, 13mm across the face edge. Such a tall and narrow profile cannot be underpinned successfully, so we have used a beech dowel to hold the joint together. An un-stretched canvas needs to be put onto a stretcher before it is framed, and some stretched canvasses are on such poorly made stretchers that they are not square enough to be framed with any finesse. We can re-stretch your canvas onto a made-to-measure stretcher of the correct thickness, so that it can be framed in a number of different styles.